The immigration system is complicated and mistakes can get you into big trouble. There are trusted organizations working together in Chicago and throughout Illinois to ensure that immigrant communities have access to reliable information and resources. Securing a FBI criminal background check prior to applying for Immigration Administrative Relief is an important resource, which aids in the evaluation of your application. As such, it is vital for you the applicant to be aware of specified active arrests or convictions on your record. Find out what’s on your FBI criminal background record before you seek relief. Get your FBI level criminal background check now! If you have ever been arrested by law enforcement, including immigration authorities, you may want to have your fingerprints taken to review your record. The USCIS requires applicants to be fingerprinted for the purpose of conducting FBI criminal background checks. All applicants and petitioners for immigration benefits must go through FBI criminal fingerprint checks. This is one of four background investigations USCIS routinely conduct, with a focus on an individual’s criminal records in the U.S.
People with prior arrests or charges will be required to submit complete documentation and certified disposition records to avoid adjudication delays, even if they have been expunged or vacated. If you are unsure about a particular incident (whether it was considered an arrest or not), it is important to consult an attorney to ensure the accuracy of information on your application. Any misrepresentation about criminal history could result in denial of the case. Let Abbott Biometrics help you submit your FBI Fingerprint Background check packet to the FBI to obtain a copy of your record. On Q Biometrics Live Scan Fingerprinting Department is certified by the Illinois Department of Financial and Professional Regulation (IDFPR) to fingerprint via Live Scan (digital) and FBI FD-258 Ink Fingerprint Card. Applicants needing an FBI level criminal background check MUST be fingerprinted by a certified fingerprint specialist. Abbott Biometrics Services is Chicago’s trusted source for ink fingerprinting. To obtain your FBI Criminal Background record. Correct errors and/or expungement prior to applying for benefits. Verify if anything on your record disqualifies you prior to applying for benefits. Prepare yourself to apply for Immigration Relief. 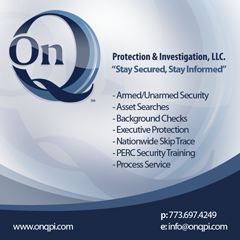 On Q Biometrics strives to capture the best quality fingerprints possible. Our success rate is very high. Occasionally, fingerprint cards get rejected because of low quality images. This is usually due to age. Although our fingerprint patterns never change, the ridge lines do get “worn down” as we age. Our fingerprint expert takes great pride in consistently producing the best possible prints. In fact we guarantee it! If your fingerprints are ever rejected due to poor quality prints, we will reprint at no charge. We try to avail ourselves at all times, and can schedule an appointment almost anytime, anywhere including weekends. Tuesday: 8:30 a.m. – 5:000 p.m.
A picture I.D. Other forms of identification may be accepted in accordance with Department of Justice regulations. Identification must be valid and current. If you are under the age of 18, you must also have a parent or guardian with you to sign a statement giving us permission to fingerprint you.